As specialist surfacing contractors in the UK, we carry out a range of projects and recently we completed a school games space installation in Cumbria. 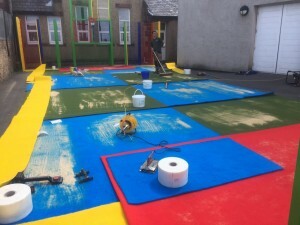 The work involved transforming a simple macadam area into a colourful and exciting activity surface which enables kids to develop a range of different skills. Funding from Sport England was given to the school through their Primary Spaces scheme to make this project happen. This grant funding was set up to help schools build new facilities which would promote activity and healthy lifestyles at primary school age. Our professional team completed the whole construction project in Cumbria from start to finish, continue reading to find out how it was done. Because the school’s existing tarmac surface was already a suitable sub base, our installers were able to begin the surfacing construction straight away. For this project, we used Multisport synthetic turf which is an extremely versatile specification that a lot of sports and activities can be played on. The artificial grass carpet is made through a needling process which makes it strong and also creates porosity for quick and effective water drainage. The design for this Primary Spaces activity surface incorporated a red, blue, green and yellow colour scheme with different sections that the children can use for separate games. Each piece of coloured Multisport turf was cut to the required size and shape before being rolled out onto the existing macadam area. If you would like to install a similar activity surface at your school, we can create a bespoke design with your own colour scheme and make any necessary changes to cut costs if you are on a tight budget. Next, the artificial carpet was glued down at the joints and the edges with a specialist glue to keep it secure and stable. The final part of the games surfacing construction was to apply a layer of sand infill within the curly yarn fibres. This is done for the synthetic turf specification to give even playing qualities and extra strength. It’s important to keep the artificial turf and sand infill well maintained to ensure safety, good drainage and optimum performance characteristics for players. For more information on sports surface maintenance, take a look at this page – https://www.sportsandsafetysurfaces.co.uk/surface-types/needlepunch/maintenance/ and please fill in our contact form to talk about costs of these services. As well as the coloured activity surfacing, the school games space installation included a PS4 enclosure with graphics panel. 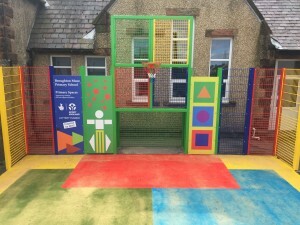 This consists of multi coloured fencing at each end of the area with a hoop and back panel, goal end and graphics panel where kids can play different activities. With the games enclosure and floor markings, there is no limit to the amount of team and individual games that can be played on this facility. Once everything had been installed and the facility was complete, the school were very happy with their new games surface. The area can be used during PE lessons and also in after school clubs to help kids increase their activity levels through fun games. To see the full school games space installation for this project in Cumbria, take a look at the video below which shows details of both the activity surfacing and the PS4 graphics panel and enclosure. Our team of professional installers work with schools all over the UK to design and build top quality activity surfaces and sports facilities. If you would like to complete a similar project to this one at your school, please contact us today. We will be able to send over some further case studies and product sheets, as well as help with costs for construction. Our services also include maintenance and repair of Multisport synthetic surfaces and other sports flooring so don’t hesitate to get in touch with us if your facility is in need of cleaning or repairs. Fill in our contact form with your details and we’d be happy to discuss school games space installation with you, don’t hesitate!